When you find out that you are expecting your first child there are a number of things you start to think about: cot, car seat, possible names and a pram, amongst various other ‘practical’ things. We spent a long time thinking about which pram to purchase – it needed to be small enough to fit in the car, not pink or blue, and plenty of other things we thought were necessary. It never really occurred to me that there was another way for a baby to commute – prams are just the ‘done thing’. Claire had bought a sling when pregnant, but I never thought it would actually replace the pram or become a long term thing. It wasn’t until after Matilda was born and when Claire started to use the sling did I see the advantages. Initially, I guess like most people unfamiliar with them, I feared that Matilda would fall out when the sling was undone, that it would be awkward to use, that it might make her ‘clingy’. 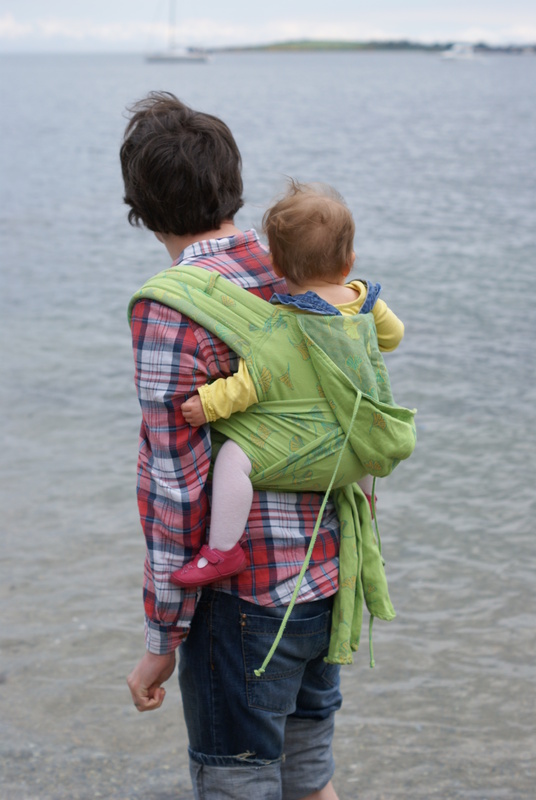 Then I tried the sling on for myself and I felt a real closeness with my child – it felt like we were one. Claire already had a special bond with Matilda having carried and birthed her and now through breastfeeding; babywearing enabled me to develop a bond with her too. One thing I love about babywearing is the interaction Matilda and I have when out and about – I can talk to her and point things out to her – things I couldn’t do with her in a pram. She sees the world from our perspective and is learning so much about everything around her, all from the comfort and security of our arms. And when she is tired she snuggles in and goes to sleep. She walks a lot when we are out now, but when she is tired, or wary of her surroundings, she puts her arms up and we put her in the sling and she gets rest and security. Babywearing is really practical too. If Matilda is tired or just wants to be close to us, I can put her in the sling and get on with things – mowing the lawn, washing the dishes. We can go for family walks in the forest without worrying about how far we can get with a pram. And we can fit all our shopping in the car because the boot space isn’t taken up with a pram. There are so many benefits! I feel like such a proud dad walking with her close to my chest. Sometimes people give you funny looks, especially now she is bigger, but I can’t help but feel for those other dads that don’t experience the kind of bond with their child that babywearing can bring. It’s so important to me as a working dad to develop a relationship with my child – babywearing is a perfect way to do that. We haven’t used that cute green pram that we put so much time and thought into buying for a very long time – it has been folded up and put away, and I have no fond memories of using it, whereas babywearing has given me so many special times and memories, and has had an wonderful impact on our child and our lives together as a family. This entry was posted in Dadology on July 2, 2013 by Connor Douglas.